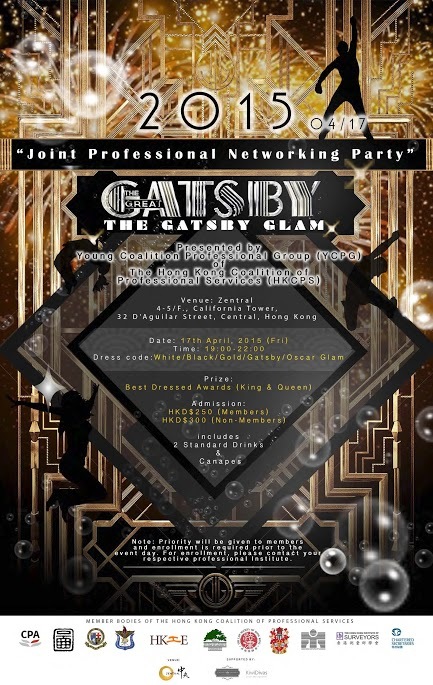 YCPG Joint Professional Networking Party 2015 - "The Gatsby Glam"
Young Coalition Professional Group (YCPG) of the Hong Kong Coalition of Professional Services (HKCPS) is organizing a Joint Professional Networking Party themed “The Gatsby Glam” this year. The event serves as a wonderful platform for different professionals to catch up and mingle with each other. Do join us for a glamorous night! Dress Code: White/ Black/ Gold/ Gatsby/ Oscar Glam – We have the Best Dressed Awards for our King & Queen! This is a first-come, first-served event. Priority will be given to Members and enrollment is required prior to the event day. Successful registrants are required to pay in advance, and confirmation email will be delivered in due course.